That’s it. That’s all you need to get started. Mix those three together, and you’ll be good to go. While putting together this simple guide explaining how to meditate for beginners, I tried to reduce it to the simplest elements I could imagine. Of course, putting those basic ingredients together is easier said than done. 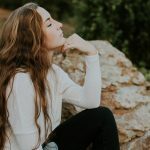 So let’s take a look at what, exactly, each of these principles means for someone who wants to learn to meditate for the first time–and for those who have already been at it for a while. As you progress on the path of meditation, I think you’ll find that this recipe never gets old. 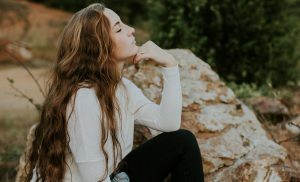 What it means: No matter why you want to learn to meditate–whether it’s to reduce your daily stress, boost your creativity, or become spiritually enlightened–you’ll only get the results you’re after if you really intend to succeed. This may seem obvious, but you can’t underestimate how easy it is to get distracted, especially when just starting a new practice or routine. So as you sit there reading these words, take a deep breath, exhale slowly, and remind yourself why you want to meditate. As your primary reason for meditating becomes clearer in your mind, try to feel more connected to your intention to really do it. Leave all of your other thoughts and worries on the backburner for a while. When you can sincerely focus your intention in this way, you’re ready to add the next ingredient. What it looks like: If you decide to meditate for 3 minutes, really do the full 3 minutes. If you decide to meditate every day for one hour, then rearrange your schedule to make it happen. When you follow through on your own intention, you can’t go wrong. What it means: If you begin every meditation session with the intention to take it seriously, then you’ve already mustered up a lot of the second ingredient in our recipe for meditative success: attention. Meditation has been called the science of attention. Learning how to control your attention is what the Zen Buddhists call “taming the ox.” In an ordinary, non-meditative state, we typically allow our attention to wander all over the place, randomly flitting from one thought, feeling, or perception to the next. But if you want to meditate, then you need to learn that you are the one who chooses where to put your attention, moment to moment. And that means that instead of letting the “ox” wander here and there, just keep reining it in, over and over and over again. With a strong and clear intention, your ability to control your attention will grow stronger with each attempt. What it looks like: Try focusing on just one thing, like your breath. Count each breath from one to ten, and when you get to ten, start over again. If your attention wanders and you lose track–and this will happen constantly when you’re just starting out–then return to breath number one and try again. 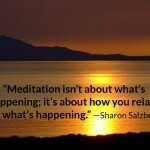 What it means: Simply intending to meditate and then paying attention won’t necessarily result in a meditative state. Now you need to add the third and final ingredient: relaxation. If you want to experience the stillness, peace, freedom, and relief that come from meditation, then above all else, you need to completely relax. It’s important to find the most comfortable posture to sit in and a quiet, non-distracting environment. Once you are seated in a comfortable position, you can’t relax too much–or you’ll fall asleep! This is where the tricky part of meditation comes in. Now you need to combine your intention, attention, and relaxation together at the same time. Many teachers will tell you that meditation is a delicate balance between being deeply at ease and completely alert. So you need to learn how to pay attention without getting tense or rigid. And you also have to relax without getting drowsy! Anyone can do it, but it takes practice. And when your intention is clear, you’re fully attentive and awake, and you feel completely relaxed and at ease, then there’s nothing more to do. That’s the meditative state. What it looks like: Choose a nice environment and a time when you can really pause and let go of the worries of the day—early morning or evening are often best. Sit on your zafu and zabuton in a cross-legged, half-lotus, or full-lotus position (your legs will get used to your preferred posture over time). Keep your back straight, and either close your eyes or keep them partially open, gazing at a fixed point a couple of feet in front of you on the floor. In this position, you should be able to relax deeply but not be so comfortable that you fall asleep. As you breathe in and out, slowly but regularly, paying attention to each breath (and counting them), allow more and more of the tension in your body and mind to release. By maintaining the delicate balance between deep relaxation and awakened attention, you will find yourself authentically meditating in no time.